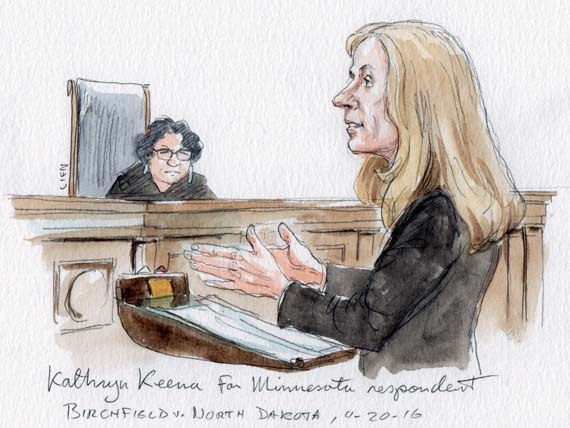 “I’m not talking law, I’m talking practical facts,” Justice Stephen Breyer told Kathryn Keena, a Minnesota county attorney, about two-thirds of the way through yesterday’s seventy-one-minute oral argument in Birchfield v. North Dakota. The issue before the Court was, of course, a legal one: can a state, without a warrant, make it a crime for a driver suspected of driving under the influence to refuse to take a test to measure the alcohol in his blood? Three men from Minnesota and North Dakota contend that the states cannot, because it would violate their rights under the Fourth Amendment to be free from unreasonable searches. But as Breyer’s statement demonstrates, the Justices today were far more interested in the facts, even as the lawyers in the case sometimes struggled to provide them to the Court’s satisfaction. And although for a while it looked like the Justices might be ready to rule in the states’ favor, it was one fact – that breath tests are normally not administered at the side of the road, but instead at the police station – that might in the end make all the difference. Things looked pretty good for the states at first. Three of the Court’s more conservative Justices didn’t seem to regard the imposition of criminal penalties as particularly problematic. Justice Anthony M. Kennedy, for example, observed that many states will revoke the license of a driver who refuses to take a blood or breath test – a civil penalty. And if that’s the case, he asked attorney Charles Rothfeld, representing the drivers, why can’t states decide to impose a criminal penalty instead? Given the choice between spending three days in jail or having your license suspended for three years, he suggested, many people might choose the jail time. This theory apparently appealed to Kennedy as well. Assuming that the statistics about drunk driving are compelling, he asked, and “innocent lives” are at stake, why can’t we just say that this falls within the special-needs exception? It then seemed to go from bad to worse for the drivers, as some of the Court’s more liberal Justices looked like they too might be ready to line up behind at least a partial victory for the states. 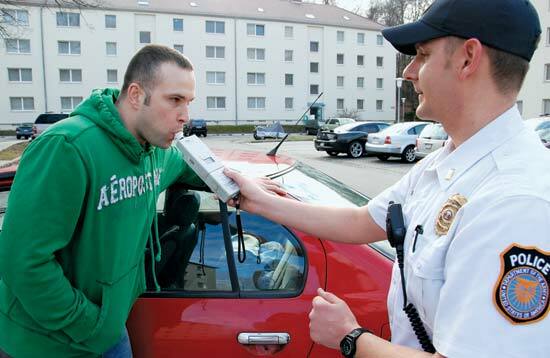 Breyer suggested that, both as a practical matter and for purposes of the Fourth Amendment, there is a significant difference between a breath test and a blood test. The former, as he demonstrated by blowing into the microphone, is “easy.” But a blood test is both painful and logistically more complicated, as it requires the arresting officer to transport the driver elsewhere. “What is wrong with a Breathalyzer test,” he asked, “when it can save lots of lives” and is given to people who are believed to be drunk? Alito chimed in, asking Rothfeld to explain how having a straw in your mouth, as the breath test requires, is so intrusive. The drivers aren’t actually objecting to the invasiveness of the breath test, he told Rothfeld. Their real gripe with the test, he asserted, is that they just don’t want their blood-alcohol levels tested. Justice Elena Kagan then boarded the breath-test bandwagon. Why, she asked Rothfeld, can’t the Court simply say that the breath test falls within another exception to the Fourth Amendment’s warrant requirement, which allows police to search both the body of an arrestee and the area around him? 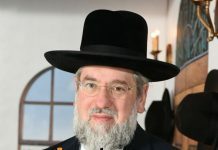 Rothfeld responded that a breath test to measure blood-alcohol levels does not have anything to do with either of the two purposes that the exception is intended to advance: the safety of the arresting police officer and a desire to prevent the arrestee from destroying any evidence within his reach. But Kagan insisted that the breath test does help to preserve evidence, by recording the driver’s blood-alcohol level before it dissipates. Remarking that “this is about as uninvasive as a search can possibly be,” she told Rothfeld that the Court can consider how invasive a search is when deciding whether the exception applies. But then the outlook became considerably less rosy for the states, as the Justices’ focus shifted to why, as a practical matter, police can’t just go ahead and get a warrant if they want a DUI suspect to be tested. 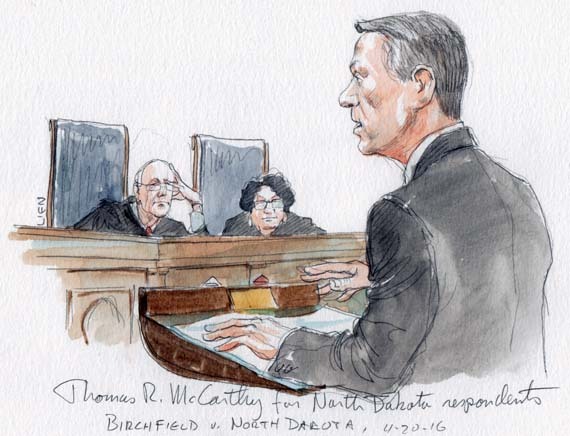 Kagan asked attorney Thomas McCarthy, representing North Dakota, to assume that police could get a warrant within ten or fifteen minutes of applying. If that were true, she queried, why exactly would the state have to forge ahead without one? Kennedy summarized the quandary facing the Court bluntly: “We find that modern technology allows, in some States, both sparsely populated and heavily populated, to get a warrant in fifteen minutes.” However, he continued, North Dakota and Minnesota are telling the Court that getting a warrant “takes too long.” In a thoroughly exasperated tone, Kennedy cautioned McCarthy that he was “asking for an extraordinary exception” to the warrant requirement. Keena, arguing for Minnesota, had an equally tough time. 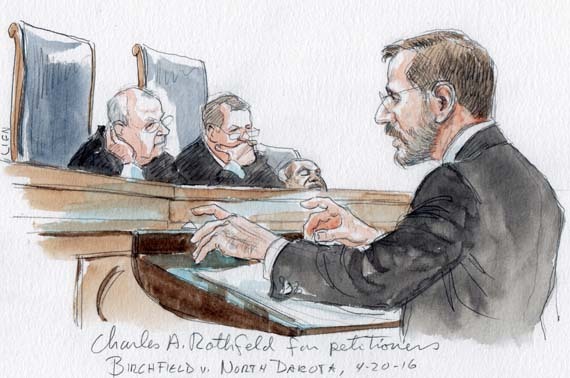 Once again, the Justices focused on the breath test. But this time they zeroed in on the fact that breath tests are usually done at the police station, rather than on the side of the road. Even if a breath test is not particularly invasive, the Justices repeatedly asked, what harm could come from seeking a warrant during the time it takes to drive the suspect to the police station? The Justices pressed Keena to explain the practical effects of such a rule. But they did not seem to regard her response – that a warrant is not especially useful for breath tests, because there is no way to force someone to take a breath test – as particularly convincing. Sotomayor offered a solution: once police have obtained a warrant, a driver who refuses to take the test can be charged with obstruction of justice. But Keena rejected that idea. She explained that, when a driver is convicted of obstruction of justice rather than on drunk-driving charges, prosecutors cannot use that conviction to enhance a later DUI charge. 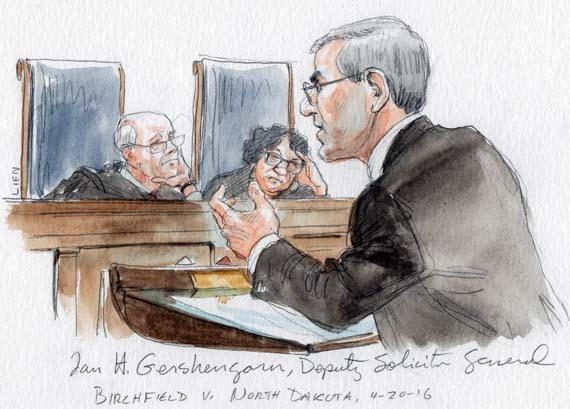 Sotomayor was adamant, responding (in so many words) that such a result would be Minnesota’s choice, and Minnesota’s problem. Arguing on behalf of the United States, Deputy Solicitor General Ian Gershengorn tried to turn the case around. He emphasized that, “in the real world,” warrants are not available twenty-four hours a day, seven days a week. 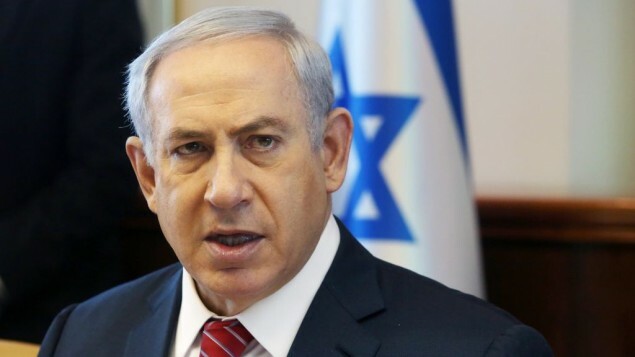 If the Court were nonetheless to assume that they are, he warned, “there is a serious risk that” evidence will be lost in the places where it takes longer to get a warrant. The Court returned once again to the idea of a distinction, for Fourth Amendment purposes, between blood and breath tests. Gershengorn agreed that the privacy concerns associated with a breath test are “substantially smaller” than with a blood test. 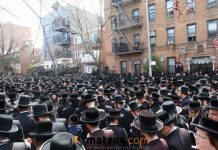 Having said that, though, Gershengorn reiterated that blood tests are also “critically important” for police and prosecutors. But after today’s argument, blood tests without a warrant may be a lost cause. The only real question may be whether enough Justices are convinced that, even if a breath test is only minimally invasive, warrants are easy enough to obtain that they should be required anyway. North Dakota, Minnesota, and the ten other states that also impose criminal penalties on drivers who refuse blood-alcohol tests will be waiting anxiously for the answer to that question.